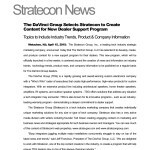 The Stratecon Group, Inc., a leading tech industry strategic marketing company, announced today that The DaVinci Group, LLC has selected it to develop, create, and produce content for a new support program for their dealers. This new program, which will be officially launched in a few weeks, is centered around the creation of news and information on industry trends, technology trends, product news, and company information to be published on a regular basis for The DaVinci Group dealers. The DaVinci Group (TDG) is a rapidly growing and award-winning custom electronics company with a “Who’s Who” roster of executives that create high-performance, high-value products for custom integrators. With an extensive product line including architectural speakers, home theater speakers, amplifiers, IR systems, and outdoor speaker systems – TDG offers solutions that address any situation a tech integrator may encounter. TDG is also known for its innovative programs – such as an industry-leading warranty program – demonstrating a deeper commitment to dealer support. The Stratecon Group (Stratecon) is a tech industry marketing company that creates individually unique marketing solutions for any size or type of tech company. Stratecon also has a very active media division with writers including founder Ted Green creating engaging content on marketing and business news and strategies appropriate for tech business owners and managers. You can see much of this content at Stratecon’s web properties, www.strata-gee.com and www.stratecongroup.com. While details on the program are still being worked out, TDG sees this as a natural extension of its overall program of support for its dealers. Beyond great products, profitable dealer programs and the best warranty in the business (it even includes an uninstall fee for dealers) – TDG even offers dealers the opportunity to become shareholders in the company. This is highly unusual in our industry…especially for a private company. More information on this new support initiative will be announced in a few weeks time when details have been finalized. The DaVinci Group was founded by a group of custom electronic industry leaders to create quality products for the custom integrator. Our speakers have been designed by engineers who specialize in the custom market, for the custom integration expert, while bringing leading performance and value to the entire product line. The group has created a business model that brings our expertise, vision and experience with the goal of becoming partners with our dealers. See more on The DaVinci Group at www.tdgaudio.com. About The Stratecon Group, Inc. The Stratecon Group, Inc. was founded in 1999 by industry veteran Ted Green and since that time it has been assisting companies large and small with brand & awareness building, content marketing, email marketing, social media marketing, public & media relations services, and more…mostly in the consumer electronics and custom integration spaces. Stratecon’s publishing division has created one of the industry’s most popular and rapidly-growing websites, Strata-gee.com, and newsletter, the SYNCH, which publishes content on the TECH industry including trends in products & technologies, marketing strategies, consumer trends, and financial performance of key industry players. TSG can be reached via phone at (732) 321-4181, fax at (732) 321-0378, email at tedg@stratecongroup.com, or on the web at www.stratecongroup.com & www.strata-gee.com. We look forward to working with the Stratecon team to bring helpful information, insight and news to our dealer base and the industry. This is going to be fun Ted! Thanks for presenting thinking outside the box.